On the 29th April 1882 in Berlin, Dr Ernst Werner von Siemens demonstrated his Elektromote. It was a carriage with 2 electric motors and the 550V DC power being supplied by an 8-wheel trolley running on top of a pair of overhead wires. The current collector bore great similarity to the Cedes Stoll system. Photographs exist of a very similar vehicle said to be taken in the American state of Nevada and reputed to date from 1885. 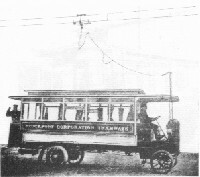 In the following few years there were reports in the press and trade journals of experiments in New England and references to an "electric omnibus supplied with current from an overhead wire" in Autocar. These references implied that trials were apparently taking place in Greenwich (according to Nicholas Owen in his 1974 book "A History of the British Trolleybus") and it appears that all records of any such events have disappeared. As I've been unable to find any other reference to this, I have to assume that the trials never actually took place and must have been just a proposal. It wasn't until 1901 that Max Scheimann, using the now conventional under-running trolleyheads and twin tramway-style wires, opened the first passenger carrying system in the German town of Bielathal on The 10th July that year. Meanwhile in the UK, developments were concentrated in the new electric tramways, which spread very quickly throughout the Edwardian era and by the end had come to the stage where all the lines that could be profitably built had been. A cheaper alternative was needed and the developments on the continent were now considered. Dundee became the first British town to go and investigate the new trackless cars in Germany (other towns had considered tracklesses), returning with a very favourable report in July 1908. However they decided to wait until other British towns adopted it and it was in 1912 they started (only to stop 2 years later) after visiting Bradford. The first trolleybus to actually run in the UK was demonstrated in 1909 at Hendon by the Railless Electric Traction company (RET). There then followed a bout of trolleybus mania as several operators rushed to obtain powers to run the "trackless trams", as they were seen as a cheaper option for routes where the expense of laying tramlines could not be justified. Though the interest was high, most of the proposals came to nothing and it wasn't until 1911 that the first operational systems started. The neighbouring cities of Bradford and Leeds, in Yorkshire, were rivals and Leeds just pipped Bradford to the post by having the first passenger service (though it is always Bradford that gets remembered as the "first" as it was the last trolleybus system in the UK). As neither city wanted to have a long running argument over who was the first, they held simultaneous official opening ceremonies making them both officially joint first. However, Leeds started running their passenger services that afternoon while Bradford's route was unable to actually commence passenger services until four days later due to their official inspection having been delayed by the planning for the coronation of George V.
By the start of the Great War eight systems were running, but all were seen as merely feeders to the tramways and in some cases it was assumed that trams would replace them should it then become economically viable. Aberdare, in fact, did extend its tramways over two of its former trolleybus routes. These pioneering systems, with their solid-tyred vehicles running over rough streets (mainly granite setts), provided the passengers with rather a rough ride. At that time, there were four rival patented systems: RET; Filovia; Cedes Stoll; and Lloyd Kohler. 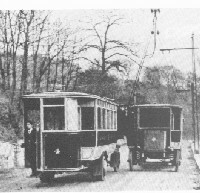 The first two used conventional tramway overhead with two wires. The RET system (which was the British version of the Scheimann system) used two trolleybooms with swivelling heads while the Filovia system used a single boom with an inverted four-wheel truck. The other two both used a form of current collector connected to the vehicle using a flexible cable. The Cedes Stoll system used a four-wheeled trolley that ran over the top of the wires while the Lloyd Kohler (or Bremen) system used a two-wheeled collector that ran on one wire with a mini-pantograph maintaining a connection on the lower wire. Both of these systems used a single pair of wires and vehicles had to exchange the collectors when passing each other. Cedes Stoll vehicles had the traction motors built into the wheel hubs. Brush held the licence for the Lloyd Kohler system. There were only two Cedes Stoll systems and two Lloyd Kohler systems (though only one used Lloyd Kohler collectors) with all of the remainder using the RET system. Stockport used the full Lloyd Kohler system while the Rhondda, having ordered 6 Lloyd Kohler cars, used RET style current collection (the trolleybooms shared a single pivot in order not to infringe the RET patent, this had been patented by Estler in 1912), this was to allow the trams to share the overhead, it therefore usually isn't counted as a Lloyd Kohler system. The Rhondda system was also the shortest lasting - only 3 months. An accident when a vehicle ran out of control was the last straw; the vehicles seemed to have suffered damage from the poor road surface. Stockport closed in 1920 after just under 8 years, but the service had been suspended on several occasions during the war. The collectors (nicknamed the 'monkey') were quite prone to drop off the wires and land in the street. The two Cedes Stoll systems fared little better (Keighley and Aberdare) both lasting only 11 years. By 1915 the war had started to have an effect and no more new systems started. Shortages, and the fact they were foreign, prevented any more Cedes Stoll systems or Lloyd Kohler systems being installed and spares became scarce. Nearly all of the pioneers started to fall by the wayside in the 1920's. The notable exceptions to this were Bradford (1911-1972), Rotherham (1912-1965) and the Mexborough & Swinton company (1915-1961). Enthusiasm was rekindled in the 1920's when first Birmingham, then Ipswich and Wolverhampton started replacing trams with trolleybuses, though Birmingham's system seems to have been just one long experiment and was abandoned before the last of the trams. The war years had seen many tramways become very badly worn and with both tracks and vehicles needing replacement simultaneously, trolleybuses were looking like a cheaper alternative to some operators. 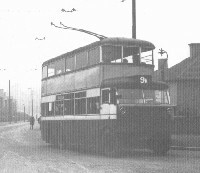 These vehicles were still primitive, but in Wolverhampton, the general manager, Charles Owen Silvers persuaded British Thompson Houston to develop a new style controller which switched the resistors remotely via contactor switches operated by relays and Tilling Stevens to modify their petrol electric buses to remove the petrol engine and generator and replace it with the new BTH equipment. Because the new controller was not directly switching traction current it was smaller than the tramcar controllers then in use and was operated by a foot pedal that worked in the same way as the accelerator pedal on motor buses. These Tilling Stevens trolleybuses steered and drove in much the same way as the equivalent solid tyred motor buses and paved the way for further developments with double deck trolleybuses which meant that by 1930 Wolverhampton had the largest system in the world with 70 trolleybuses in service - mostly built by the two local firms of Guy and Sunbeam. 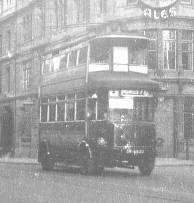 Thanks to Charles Owen Silvers' developments, the trolleybus became seen as able to be the mainstay of any transport fleet and Wolverhampton was usually the first port of call for any operator considering trolleybuses. The London United Tramways company established a very small system in 1931 and once the London Transport Board was set up in 1933, they decided to replace all London's trams with trolleybuses and by 1939, London's fleet dwarfed all others and had triggered more tram to trolleybus conversions. In terms of comfort and speed, the trolleybus was second to none and was far more modern looking than the motorbus. The lack of vibration and the quietness made them very comfortable and therefore popular with passengers, though the quietness earned them the nickname "the silent death" as pedestrians quite often could not hear them coming. Also, with no vibration, the vehicles had a much longer lifespan than the motorbus. 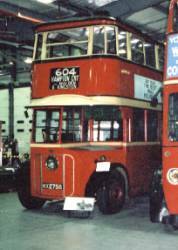 Wolverhampton's neat little Roe bodied trolleybuses looked brand new, but in reality were new bodies on old chassis. The rapid development of the trolleybus can be seen in the changes in styling from 1930 to 1936. A view of the Cleveland Road depot shows vehicles that were delivered between 1926 and 1929. The first double decker had an open staircase, while all the others had fully enclosed staircases, but essentially they were all the same. Wolverhampton's 1930 deliveries were much the same as the 1926 vehicles, slightly rounded but still rather tram like and with the upper deck starting from behind the driver's cab. The 1931 vehicles were of the piano front type. Now the upper deck continues over the front of the driver's cab. The 1932 ones were piano fronts with cleaner lines. The bulge at the front with the destination blind is not quite as pronounced. The 1934 ones were streamlined and starting to look very modern, though still a bit bulbous at the front. 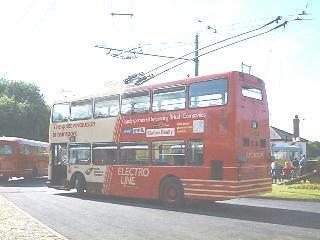 They were very similar to the Birmingham trolleybuses. By 1935, the trolleybus had virtually reached its final form in terms of styling. This vehicle doesn't look very much different from the ones delivered in 1950. The Second World War changed everything. Only two new fleets started after it and only one (Glasgow) was actually a new installation, the other was a joint operation in Brighton where all the routes were already being operated by the corporation and the new vehicles were operated by the Brighton Hove and District company (they'd been in storage during the war). Motorbus design started to catch up and the change over from petrol engines to diesel engines had produced a second rate rather than third-rate vehicle. Some undertakings began a programme of rebodying their utility vehicles, Bradford taking the opportunity to introduce forward loading buses with platform doors and saloon heating. As the supply of new vehicles during the war had been restricted, the opportunity was taken to order new vehicles, many of which were to the new maximum width of 8'. London ordered new vehicles to replace its original fleet resulting in the Q type 8' wide 6 wheelers. After the war London changed its mind and announced that the remaining trams would be replaced by diesel buses, this had more to do with the fact that AEC now only built diesel buses and trolleybuses were mainly built in the midlands than with economics. When this had been completed, they announced in 1954 that the trolleybuses were to suffer the same fate. 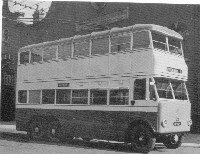 With the potential market cut by over a half, the end was inevitable and was accelerated when London found buyers in Spain for the Q type trolleybuses, which brought forward the end of the system to 1962 (the original date was going to be around 1969, which would have been the earliest date that the Qs would be able to be replaced). The 1960's saw a steady decline with system after system closing. Bournemouth had tendered for new trolleybuses, but the manufacturers came up with silly quotes - they'd decided it was too much bother without London as a potential customer and continental manufacturers weren't interested in producing any right hand drive versions of their trolleybuses. Nobody seemed to notice that each route closed became more expensive to run, proving the accountants wrong. Many systems (Bradford and Wolverhampton are cases in point) turned from being pro to anti when the General Manager retired and his replacement saw trolleybuses as outdated. Walsall had been determined to hold out, but in 1969 the PTEs were created and the West Midlands PTE took great delight in closing the system, pretending they were just continuing Walsall's policy (it has since emerged that Walsall were intent on buying Bournemouth's MF2Bs to convert to driver only operation), the work had already started on one vehicle when the PTE took over. Teesside fell in 1971 (only because they could no longer obtain spares) and Bradford in 1972 (they only hung on so they could claim to be the first and last system). Fate was very unkind to Bradford, they had a change of General Manager right at the end - too late to save the system. South Yorkshire PTE went as far as getting Dennis to produce a trolleybus version of its Dominator and ran it on a test track at Doncaster racecourse. However deregulation meant that the buses were handed over to a private company and the experiment was killed off, though the vehicle stayed with SYPTE who keep it at Sandtoft, where it still runs. Deregulation promised to deliver a whole new world of modern cheap buses but actually decimated public transport. This was obvious to anybody who remembered that the Nuclear Power promise of "electricity too cheap to meter" also proved to be totally false. Deregulation is also preventing any proper public transport provision from being planned (which was the very reason it was originally introduced). There have been various proposals for new trolleybus systems at Bournemouth (a heritage tourist route), Bradford, Brighton, Cambridge, the Isle of Wight (dual mode buses), Hull, Leeds, Liverpool (guided buses) and Rotherham. None of these got anywhere, though I'm told that the Liverpool proposal only failed because they insisted on an expensive electronic guidance system. Transport for London (formerly London Transport) has proposed several new rapid transit schemes, some of which it has been taking public opinion over the use of trolleybuses, as they will be mainly street-bound. However it strikes me that the tramway lobbyists are stopping at nothing to prevent this, despite the total unsuitability for one route which would be 100% on-street mixing with other traffic. So what is the future of the trolleybus in the UK. With tramways being the fad of the moment, it is highly unlikely to return in the near future, though abroad a lot of abandonment policies have been reversed (Athens and Lyon both having renewed their fleets in recent times), Rome has announced the restoration of its trolleybuses after a 30 year absence. Ghent, was for quite a while without its trolleybuses due to road schemes and its resumption was in some doubt, but after some hesitation, the system reopened. Wellington, in New Zealand, is to renew its fleet after the successful trial of a new prototype. The current hope is that Leeds may go ahead with trolleybuses, but even though they are being talked about quite enthusiastically, it is wise not to hold ones breath. Trolleybus overhead is cheaper to put up and takes less time than tramlines, especially as all cables and drains have to be relocated from under the tracks, while all trolleybuses require is the wires - they don't have to be guided or run on their own roads (though bus lanes do help). There are the disadvantages of a lower passenger capacity (though articulated buses can hold 150 passengers) and having to share the road with other traffic, of course tramways are justified to cover the extremely busy routes where usage will be high enough to cover the cost, but it has to be based on more realistic expectations and the "trams at any cost" brigade have to be ignored. The main problem is that politicians want prestige projects and usually understand little about what actually works. Some of the newly opened tramway systems have in reality been disastrous, though PR Spin is used to disguise this (talking to the drivers and conductors, as I have done, reveals the truth). Passengers much prefer clean vibration and noise free electric transport to what they see as dirty diesel buses, so I think it's fairly obvious that trams can provide the backbone of any large city's network with the gaps being filled by trolleybuses, but the suburbs are best served by fume free, silent trolleybuses.